Berlin – IOM’s Missing Migrants Project (MMP) estimates that at least 3,114 people died or have gone missing on migratory routes across the globe in 2018. The Mediterranean region, the Middle East, North Africa and the Americas rank among the planet’s deadliest migration corridors, each zone tallying confirmed fatalities of at least 100 in 2018 (see chart below), some into the thousands. At least 219 people have died on their journey during the month of October, most recently two migrants whose remains were discovered in South Texas along the US-Mexico border. Those remains were found on ranch lands in neighbouring Dimmit and Webb counties. These two people remain unidentified. At least 166 migrants have died after crossing the border from Mexico into Texas in 2018, almost half of the 341 fatalities recorded across the border zone, which stretches beyond Texas to include the US states of New Mexico, Arizona and California, as well as the Mexican states of Tamaulipas, Nuevo Leon, Coahuila, Chihuahua, Sonora and Baja California. MMP also noted that this week in the Western Mediterranean, there have been reports, still unconfirmed, of approximately 54 people who went missing at sea after leaving Morocco from the Port of Bouyafar on 27 October. After initiating distress calls to authorities and family members of those on board, nothing has been heard since from those migrants. Stormy weather conditions in the Alboran Sea this week have added to concern about the whereabouts of these people. 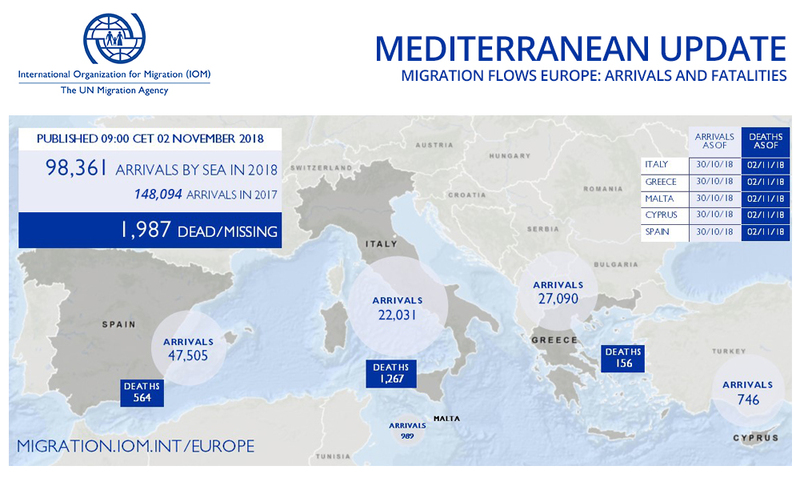 Those victims, if confirmed, would bring the total number of Western Mediterranean deaths this year to 618 through 30 October, which compares to 224 on that route during all of 2017. Frank Laczko, Director of IOM’s Global Migration Data Analysis Centre, said newly released figures on the number of migrant deaths compiled by Associated Press (AP) journalists, which suggest that 56,800 people have died while migrating since 2014, highlight the tragedy of how little even experts in the field know about those who die far away from their homes. They include deaths and numbers of missing people within country. They include more data and estimates from developing country sources such as NGOs helping families to trace family members. Data on the United States/Mexico border are compiled from US county sources, including: medical examiners, coroners, and sheriff’s offices, as well as from media reports for deaths occurring on the Mexican side of the border. In Africa, data are obtained from media and NGOs, including importantly, the Mixed Migration Centre’s 4mi surveys. In all cases, new entries are checked against existing records to ensure that no deaths are double-counted. This is particularly important for records that come from the testimonies of other migrants, which are nearly impossible to verify. The quality of the data source(s) for each incident in the Missing Migrants Project database is assessed through the “source quality” variable. It is impossible to know the true number of people who die during migration because most deaths occur in remote areas chosen to deter detection. As a result, bodies are not always found quickly, if ever, and deaths may not be reported systematically to authorities. Another reason Missing Migrants Project figures represent a minimum estimate of the number of migrant deaths is that they do not include missing persons reports, because people who are “missing” are not necessarily dead. Tradition tracing programs, such as those run by the International Committee of the Red Cross (ICRC), are still adjusting to the complex context of international migration, in which a missing person could be many countries away from their family who is waiting to hear from them. Migrants who die or go missing after they are established in a new home are also not counted by MMP. Therefore, the deaths of people who die in a country in which they do not have citizenship are not included unless individual records include evidence to show that they died shortly after they arrived. This is particularly difficult to determine in countries’ records on the repatriations of bodies of their citizens who have died abroad. As a global project, it is nearly impossible to follow-up with these individuals’ families (and may, in fact, be inappropriate to do so) to ask about the circumstances of their loved one’s death. Despite daily monitoring, Missing Migrants Project necessarily records deaths retrospectively and even after several months, depending on the data management systems of local authorities, such as coroners, or NGOs who conduct surveys. Therefore, IOM’s global figures on migrant deaths are not meant to provide precise day-to-day updates, but instead to give an indication of the scale of this crisis over time. “Until there is political commitment to recognize and take responsibility for the deaths of these people, IOM will continue to record the deaths of ‘missing migrants’ and to provide a minimum, and strong, estimate of how many people have died during their journeys,” Laczko concluded.